Your message will be sent to Dan Mancinelli. Brian and Dan each bring a unique perspective to their partnership and since joining forces their expert negotiating skills and cutting edge marketing have made them the number one team in their area.They hold numerous sales records and are widely recognized experts in Los Angeles real estate. 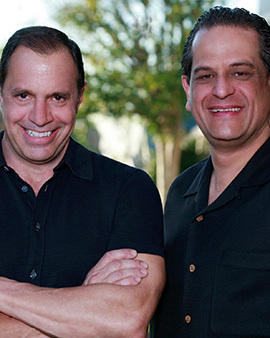 Extensive experience in a broad spectrum of real estate transactions including specialized training for the complexities of short sales have earned Brian and Dan a reputation as agents with the utmost integrity. They are proficient in advising sellers on how to best improve curb appeal and interior ambiance of their properties. Their professional services maximize buyer interest and that translates statistically into the properties they represent being sold for a superior price with less time on the market. Brian and Dan’s skilled knowledge in market information and community amenities are an invaluable resource to prospective buyers when determining value and contemplating making a home their own.They are active in community events and make a charitable contribution with every closed transaction. Born in Denver Colorado, Dan Mancinelli began his love affair with Los Angeles during his first visit in the late 1980’s. He moved here shortly thereafter and has been a neighborhood resident ever since.Dan has a keen interest in architecture, a B.A. in Hospitality, Meeting and Travel, and loves animals. Dan’s hobbies include gardening, going to the gym, spoiling his cat and hiking to notable Los Angeles sites such as Griffith Observatory with his Jack Russell terrier. A Los Angeles native and neighborhood resident, Brian Moore’s belief in achievement and passion for refined perfection is reflected in his appreciation of the arts, devotion to culinary excellence and love of distinguished architecture.Brian owns several architecturally significant properties and restoring these gems to their original splendor is an ardent favorite of his eclectic interests which also include snorkeling, photography and running.